The governor said his “interest and focus” is on Iowa, but Branstad said as a “loyal American citizen” he will consider whatever Trump might ask him to do. “I’m a team player. I love the country and if the President of the United States were to ask me to consider something, before I even know what it is, I’m not going to rule it out,” Branstad said. In 2009, Branstad got his wife’s blessing to return to the campaign trail and run again for governor. Branstad’s making it clear she likely has veto power on this, too. 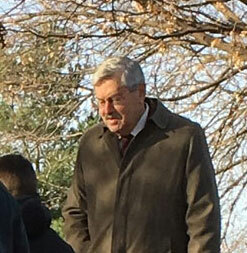 As Branstad spoke with reporters, Chris Branstad was in another room at Terrace Hill, hosting a group of turkey producers and some of her grandchildren after the official “turkey pardoning ceremony” at the governor’s mansion.